February 1861 was a time of great stress and conflict in the United States. On February 1 Texas became the seventh state to secede from the Union. On February 4 the first six seceding states (in chronological order: South Carolina, Mississippi, Florida, Alabama, Georgia, and Louisiana) met in Montgomery, Alabama, for the Provisional Confederate Congress. Four days after the Congress opened, on February 8, they adopted a provisional constitution to formalize their new country: the Confederate States of America. The next day, February 9, they unanimously elected their provisional president: Jefferson Finis Davis. Photo: the resolution adopted by the U.S. House of Representatives on 11 February 1861 guaranteeing non-interference with slavery in any state of the Union. The nation was now split in two. Members of the U.S. Congress feared further division – after all, eight slave states remained in the Union, and there was the possibility they would follow the first seven into secession (four eventually did). Debates raged in Congress about how best to resolve the crisis, how the seven seceding states could be reconciled, and what measures would help convince the remaining eight slave states to stay in the Union. Although there was strong abolitionist sentiment in the North, most politicians agreed that preserving the Union, not ending slavery, was the country’s highest priority. With the goal of preserving the Union and mollifying the remaining eight slave states, the U.S. House of Representatives unanimously approved a resolution on 11 February 1861 which seems startling to us today: a solemn promise guaranteeing non-interference with slavery in any state of the Union. A report of the proceedings in the House that day shows just how contentious the state of affairs had become. Note the objections of the Southern representatives, especially Thomas Carmichael Hindman of Arkansas, a strong supporter of slavery and the right of states to secede. Resolved, That the Committee on the Judiciary be instructed to inquire into the expediency of amending the Constitution of the United States so as expressly to forbid the withdrawal of any State from the Union without the consent of two-thirds of both Houses of Congress, the approval of the President, and the consent of all the States. Mr. Winslow [NC] objected, and the resolution was not considered. 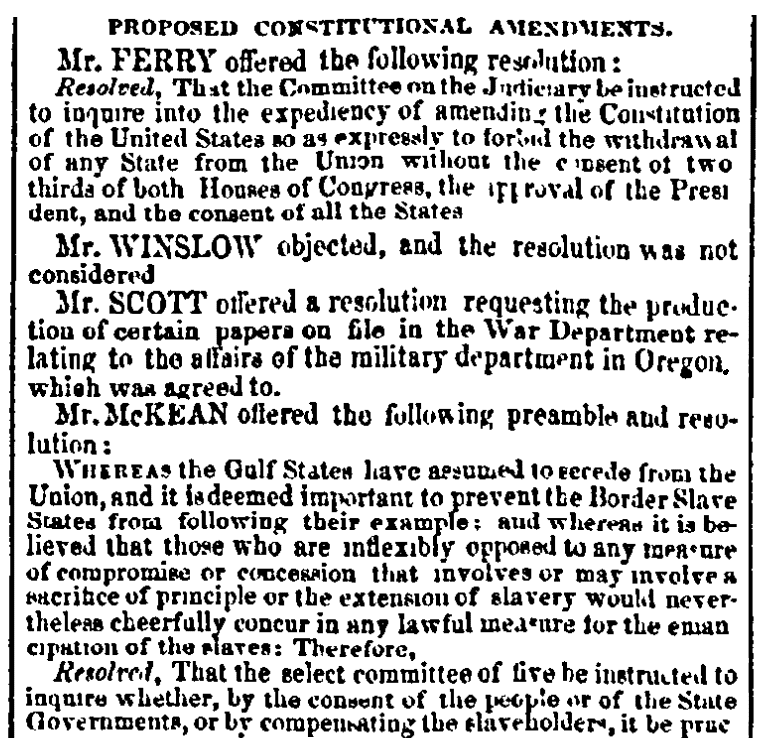 Resolved, That the select committee of five be instructed to inquire whether, by the consent of the people or of the State Governments, or by compensating the slaveholders, it be practicable for the General Government to procure the emancipation of the slaves in some or all of the Border States, and, if so, to report a bill for that purpose. Objection being made, the resolution was laid over. 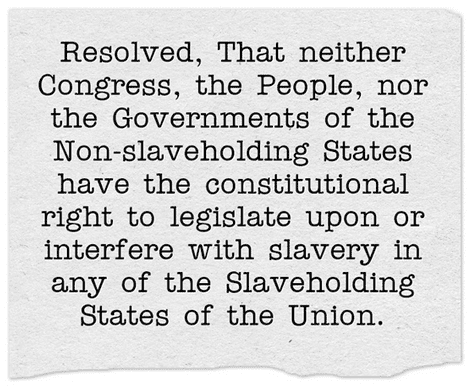 Resolved, That neither the Federal Government, the People, nor the Governments of the Non-slaveholding States have a purpose [i.e., intention] or the constitutional right to legislate upon or interfere with slavery in any of the Slaveholding States of the Union, and that those who do not subscribe to the foregoing principle are too insignificant in number and influence to excite the serious attention or alarm of any portion of the people. Mr. Palmer [NY] called the previous question. Mr. Branch [NC] moved that the resolution be divided so that it could be separately voted on. Mr. Hindman [AR] again rose to ask a question and was again met by noisy interruptions, amid which it was ascertained that he contended that Mr. Lincoln, having declared that the Union could never exist between states half slave and half free, that therefore all the indications were that it was the settled purpose of Mr. Lincoln to interfere with slavery in the States. Mr. Palmer [NY] objected to debate as out of order. Mr. Hindman [AR] again resumed, and, the Chair having ruled all debate out of order, what he said was lost in vociferous calls to order. Mr. Craige [NC] desired a division of the question. Whatever the conduct of gentlemen outside might be, at least they ought to conduct themselves like gentlemen in that Hall. He wished to have the resolution so divided that while they might safely vote that the Government had no constitutional right to interfere with slavery in the States, they might not pledge themselves to what was untrue, that they believed the Government would not interfere with it. The result would place them in a false position. Mr. Burnett [VA] supported the motion for a division of the resolution. The yeas and nays were called on the resolution, omitting the latter portion of it in reference to any insignificant party in the North who might be supposed to differ from the expressed sentiment of the majority in the North. Mr. Boteler [VA] wished to know whether the resolution could be further divided so as to vote first on the purpose and next on the question of constitutional right. The Speaker said this could not be done, as the voting had already commenced, and several gentlemen had responded to their names. Mr. Hindman [AR] again rose, amid great confusion, and pressed a question of order, insisting on the right to demand a divided vote on the resolution. He believed the assertion in the resolution that the people of the Non-slaveholding States have no purpose to interfere with slavery is untrue. A general demand for calling the roll was here made. The vote proceeded. Mr. Burnett [VA] could not vote to say that it was not the purpose of the North to interfere with slavery in the States. Mr. Bocock [VA] declined to vote. Mr. Brabson [TN] could not so vote as to have it inferred that he pledged himself that the North had no intention to interfere with slavery. Mr. Hindman [AR] could not vote for a resolution which was founded on a falsehood. Mr. Mallory [KY], believing that the North had no intention or purpose to interfere with slavery in the States, voted aye. Mr. Maynard [TN] said that Northern gentlemen ought not to expect members on the other side to vote as to their purposes. Mr. McClernand [IL], understanding the resolution to include all people North, voted aye. Mr. Phelps [MD] voted no, believing that the people have a right either to establish or prohibit slavery within their own State limits. Mr. Quarles [TN] hoped the main principle enumerated in the resolution was true. Mr. Ruffin [NC] looked upon the resolution as a political trick, and refused to vote. Mr. Stout [OR], believing that he would express the unanimous sentiment of the people of Oregon, voted aye. Mr. Cox [OH], believing that the majority of the people had no purpose to interfere with slavery, voted aye. Mr. Woodson [MO] said there was an assertion of fact of which he was not informed positively, and would therefore vote no. Mr. Leake [VA] said the resolution was designed to be one-half true and the other false. The vote was declared—yeas 106, nays 4. No quorum. Several members on the Republican side requested to be allowed to vote. Objection was taken, but overruled by the Chair. The vote then stood—yeas 116, nays 4. On motion of Mr. Hoard [NY] the House reconsidered the vote by which the resolution was passed. Mr. Burnett [VA] demanded a division of the resolution. On motion of Mr. Sherman [OH] the resolution was modified so that every member could vote for it. Resolved, That neither Congress, the People, nor the Governments of the Non-slaveholding States have the constitutional right to legislate upon or interfere with slavery in any of the Slaveholding States of the Union. This, under the operation of the previous question, passed—yeas 161, no nays. Women’s Suffrage Centennial Quotes – Can You Guess Who Said Them?